A brand-new company offering a brand-new synth that really does something, well, brand-new? Audiaire is going for the third option. It’s a new company in the world of soft synths – with a name I’m bound to spell incorrectly at some point – but in Zone, it has created a synth with Parameter Sequencing. This enables you to map out how your synth controls will react and play when notes are pressed and, while it’s not a totally new concept in the world of synths – I’ve seen it on a few hardware synths I’ve reviewed – the way that Audiaire has implemented it in Zone could be a stroke of genius. I’ll jump straight into this and come back to Zone’s synth architecture shortly, as it really is the main event. Quite simply, the GUI’s main central area shows sequencer lanes in which you can draw shapes graphically or load in preset shapes. These are simply graphical representations of parameter changes per knob, so you can draw in a parameter sequence for pretty much every control on Zone. The best bit is that you can simply hover over the name of a control and then drag it into the window, thus creating a new sequencer lane for it. In order to draw, you simply mouse along a lane up or down, although clicking on each lane opens a larger window, allowing greater fine-tuning. Believe me, this is easy stuff and you’ll soon be looking at lanes of your own parameter sequences, as it’s so simple to implement and add to. It’s also worth pointing out that each lane can run at its own rate and number of steps with definable start and end points. When you add in an extraordinary level of options for controlling how lanes play – you can flip, randomise, mute steps, add arpeggiation, change scale and a lot more – you’ll quickly start to realise that sound-design options are many and varied, and that’s before I’ve even looked at the rest of the synth. This is where it gets even more interesting, because Zone’s main architecture means that there are plenty of parameters to add to the sequencer – it really is a fully featured synth in its own right. You start with a couple of identical oscillators, each of which can load in wavetables from 150+ presets, many of which were taken from classic analogue synths. Interestingly, you can also load in your own, giving Zone an extra layer of creativity right at its core. There’s also a switchable noise and sub-oscillator, to give you some added dirt and bottom end. 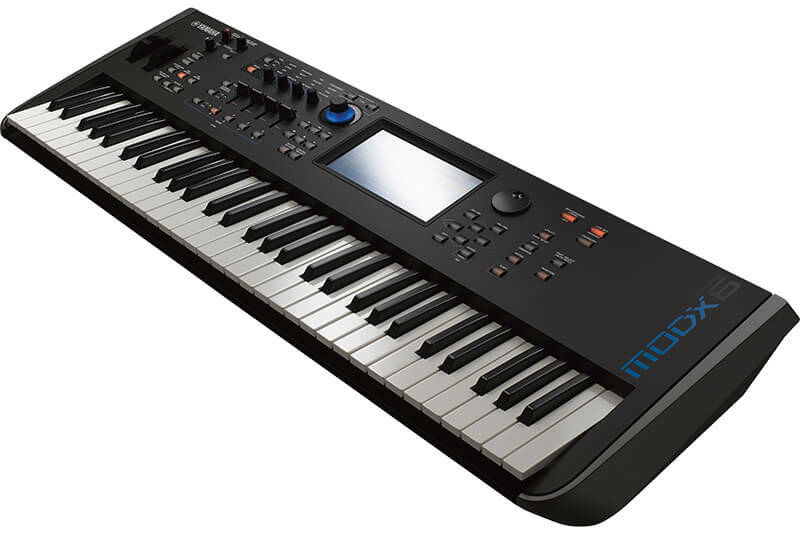 The synth features several different modes for both playback – including useful Hold and Chord modes, plus a Unison mode with Voice and Spread options for fattening up your sounds – and the onboard oscillators. These include several distortion and modulation options (Ring, FM, Amplitude), so there’s plenty going on at the heart of Zone. when you combine it with the Parameter Sequencer, you easily conclude that this is a synth with a hugely varied and very dynamic sound. There are loads of presets to cover here, so I’ll try and do that with broad sweeps. Many obviously go for lots of movement, as that really is the synth’s strength. You almost can’t help yourself adding rhythm, pitch and filter variations to pretty much everything you touch. In fact, my only real criticism is that sometimes, the presets try too hard to tell you about the Parameter Sequencer. The Best Of section contains – probably on purpose – the most dramatic examples of this: loads of in-your-face and extreme rhythms and basses and therefore a few too many novelty acts. Honestly, you’re better off delving in the arps and pads to get a better flavour. Some of the latter that use the Parameter Sequencer in a more subtle way are simply extraordinary, with some lovely nuanced bowing and droning. The basses, too, can be both simple and powerful, with enough throb and distortion as your contemporary dance production will ever need. There’s also great selection of rhythmic hits, stabs, loops and ideas in the Drum & Beats folder. Thanks to the Parameter Sequencer, Zone can really show off some extreme sonics. Like many a great production tool, though – I’m thinking Autotune, panning, even reverb – it’s the more subtle route that appeals to me. Having such extreme capabilities is no bad thing – this synth can sound like no other – but do look further inwards to the synth’s more emotive sounds for a richer idea of where Zone can head. You’ll be rewarded by one of the most varied-sounding synths out there. This is pushing it as an alternative, but MODX does share many of the parameter sequencing options so ably demonstrated by Zone, and they are both fabulous sound designers, albeit in different price leagues. 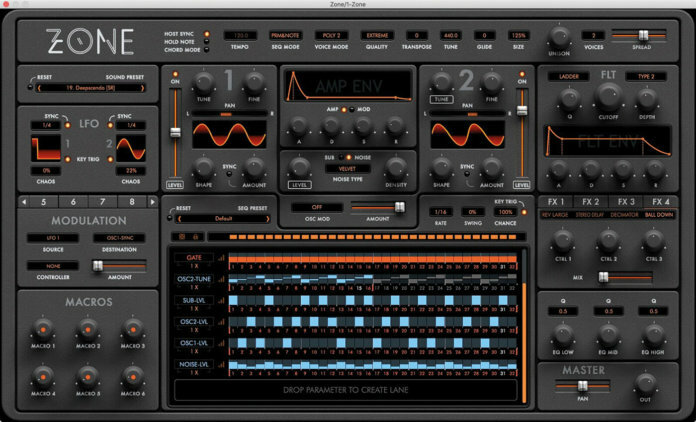 Zone is reminiscent of Carbon Electra, a synth with more limited parameter sequencing by way of a step editor, but one with similar rhythmic, dance and in-your-face capabilities. It’s a real steal at £40, too. – …although you might think there are too many! Zone is a powerful and flexible synth that invites – and hugely rewards – experimentation.